Prepare to get very excited as the co-headlining tour of the year makes its way to Frank Erwin Center on Friday 1st November 2019! 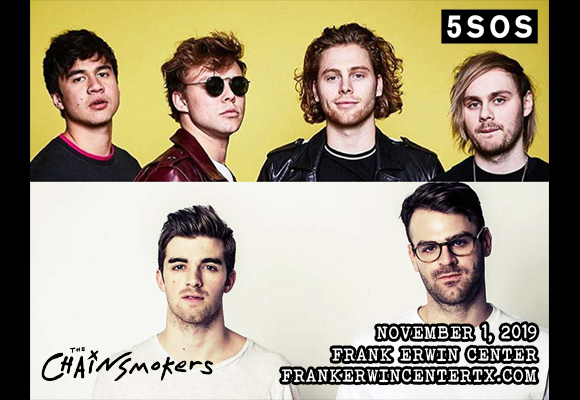 Join hit-making EDM trio The Chainsmokers and Australian pop rock band 5 Seconds of Summer for the World War Joy Tour! The two phenomenally popular acts, who collaborated on this year's single, “Who Do You Love”, will be performing a full set each, plus there'll be support from Canadian Nashville star Lennon Stella! With one Grammy Award, two American Music Awards, seven Billboard Music Awards and eight iHeartRadio Music Awards under their belt, EDM trio The Chainsmokers have achieved a lot since forming in New York City seven years ago. Consisting of DJs and producers Alex Pall and Andrew Taggart, as well as drummer Matt McGuire (who joined the duo in 2017), the outfit's breakthrough came in 2014 with the release of the single "#Selfie", which became a top twenty hit in several countries. The group followed with its debut EP, Bouquet, which was released in October 2015 and featured the single "Roses" which hit the US Billboard Hot 100 top ten. To date, The Chainsmokers have released two studio albums and three EPs – their most recent release being the album Sick Boy, which came out in April 2018.